The rate of infections with B. burgdorferi and other tick-borne pathogens are steadily increasing in Vermont, and researchers are discovering new, previously unknown species that cause Lyme disease symptoms. 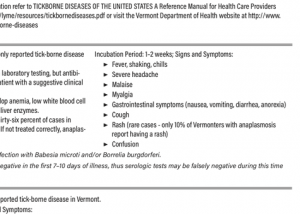 Vermont needs more physicians skilled in the diagnosis and treatment of tick-borne diseases. The controversy and confusion about Lyme diagnosis and treatment leaves some Vermonters undiagnosed, undertreated, and vulnerable to long-term, preventable, health problems from Lyme disease and other tick-borne infections. Currently, many Vermonters already sick from neurological or untreated infections must travel hours to receive effective treatment. 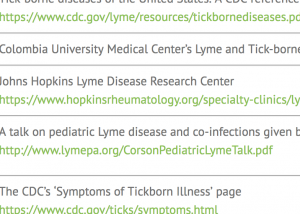 Currently, the only NGC endorsed treatment guidelines specific to Lyme disease in the U.S. are peer reviewed Evidence Assessments and Guideline Recommendations created in 2014 by ILADS. New IDSA guidelines are anticipated in 2018. ILADS offers an annotated appendix with comparisons of the IDSA and ILADS guidelines. 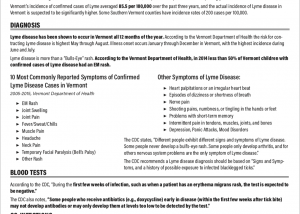 In 2018 the VDH and CDC announced the first confirmed death from Lyme Carditis in Vermont. The International Lyme and Associated Diseases Society (ILADS) offers a Physician Training Program. Their goal is to foster excellence in care for Lyme disease patients, addressing the challenges and changes in effectively diagnosing and treating tick-borne diseases. Scholarships are available. Infections present in ticks in Vermont, such as Babesia, may exacerbate the symptoms of a Lyme disease infection. Some tick-borne infections require different treatment than a Bb infection. When a patient does not respond to treatment for Lyme disease, or their symptoms reappear after treatment, they may have another tick-borne infection. Tick-borne diseases may present as ADHD, learning problems, social difficulties, emotional lability, eating disorders, self-harming behavior, depression, and more. In some pediatric patients, neurological or psychiatric symptoms may be the only sign of infection.